Charged with Adeleke are: Sikiru Adeleke, Alhaji Aregbesola Mufutau, principal of the school, Gbadamosi Thomas Ojo, school Registrar and Dare Samuel Olutope, a teacher. They will be arraigned before Justice I. E. Ekwo. The police four weeks ago had declared Adeleke wanted over the offence and had asked him to report in the office of the Special Investigation Panel for prosecution. This was some few days to the governorship election on 22 September. According to reports, President Buhari overruled the invitation. 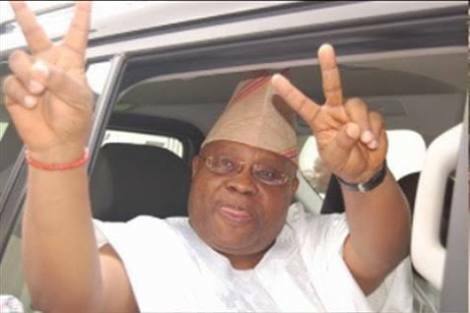 “Senator Ademola Adeleke and four others were arrested, investigated, granted bail and being charged to court. Charges of Examination Malpractice, Criminal Conspiracy, Personation, Breach of Duty, Aiding and Abetting against Senator Ademola Adeleke (PDP Governorship Aspirant in the 22nd September, 2018 Gubernatorial Election in Osun State) and four (4) others namely; MR Sikiru Adeleke, Alhaji Aregbesola Mufutau (Principal of Ojo-Aro Community Grammar School, Egbedore LGA, Osun State), Mr Gbadamosi Thomas Ojo (School Staff responsible for the registration of candidates for NECO), Mr Dare Olutope (School Teacher who facilitated the commission of the crime) have been filed at the Federal High Court, Abuja under the Examination Malpractice Act, CAP E15, 2004 today, Wednesday, 19th September, 2018. “Consequently, Senator Ademola Adeleke (PDP Governorship Aspirant in the 22nd September, 2018 Gubernatorial Election in Osun State) and four (4) others namely; MR Sikiru Adeleke, Alhaji Aregbesola Mufutau (Principal of Ojo-Aro Community Grammar School, Egbedore LGA, Osun State), Mr Gbadamosi Thomas Ojo (School Staff responsible for the registration of candidates for NECO), Mr Dare Olutope (School Teacher who facilitated the commission of the crime) are hereby advised in their own interest to report to the Special Investigation Panel, Force Headquarters, Abuja immediatel y for arraignment in court”.